'Hanami' is a Japanese celebration where they dine and drink under cherry blossom trees to welcome spring. At Eastin Hotel's Hanami celebration, we did indeed dine under some prop trees but it was the sake pairing that we really welcomed. The entrée was marinated salmon cartilage, simmered lotus root, and deep fried almond prawn mousse served with Saito Karakuchi. Karakuchi, which means dry in Japanese, is a crisp, refreshing sake which went very well with the combination of flavours of the entrée. Next up was the delicious fresh Canadian oyster with miso sauce and wild Japanese sea bream. 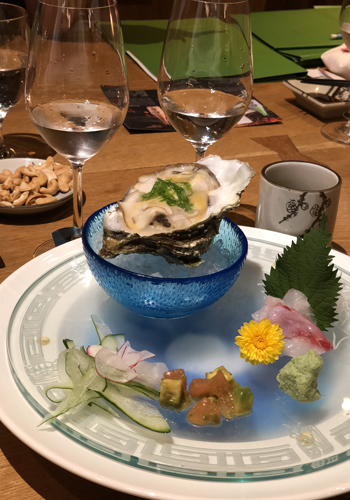 Together with the Saito Junmai Daiginjo, a rich sake with a fruity aroma and acidic finish, the oyster really made our night. The oyster’s slight tang of saltiness was combined with the Junmai Daiginjo’s richness and with further help from the miso sauce, it became an explosion of flavour in our mouths.Who knew that fresh oyster could taste better than it already is? Who knew that fresh oyster could taste better than it already is? The highlight of the menu would have to be the A5 Wagyu Beef Teppanyaki served with Sakura rice, asparagus and sesame sauce on the side. It was only appropriate for the Saito Super Premium Junmai Daiginjo to be paired with the dish. The rich aroma and flavour of the beef is offset by the delicate taste of peach and banana in the sake. Its smoothness could have made it a dessert in itself. 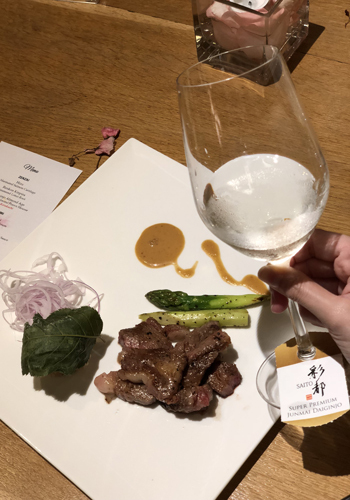 While Eastin Hotel's Hanami sake pairing was only available once, here's hoping they'll have more of these pairings to come!